Ha! Well, so far we have managed to pull the Christmas tree and bin of ornaments out of the basement. That’s about as far as we have gotten. That’s a start at least! 👏🏻 I think that getting it all down is the hardest part, like ripping off a bandaid to start the new season. Ours either — although, I like to watch those movies, too! So hopeful and cheery. Reality: most of my decorations are hand-me-downs or homemade, and my husband had to repair a lot of things as we decorated this year. I had to be the one to throw away some family stuff too, but it made a good excuse to add a few new ornaments too. Are your ornaments mostly homemade or hand-me-downs? Yep! Most of them are ones the kids have made. Or ornaments that we have been given as gifts over the years. They definitely don’t follow any theme or color pattern. But they contain lots of fun memories! Yes. This is your first Christmas without them, right? It is the second without my mom and the first without my grandma, and it feels really final because they hold the majority of my childhood memories. I was super close with my Mamaw. When I unwrapped her Christmas stuffed animals box, I could smell her house again, and I just had to really savor the scent and move on. 🐻 🏠 I want my son to remember the cute scene and not me crying over it, you know? I understand what you mean. Is it hard to feel in the Christmas mood sometimes when memories and sad times pop up this year? Yes, and most of the time we moms try to just bury the feelings because the expectation is the happy face and the Hallmark house. I know Mamaw is smiling, glad I have cleared more clutter out of the house and not hanging on to broken decorations. Right – although none of us probably have that Hallmark house. And it probably isn’t healthy for us to try to fake a happy face, huh? No, it really isn’t. I am glad we are talking about this, because it is so true. None of us live in a Hallmark movie. Why do we feel pressured to live up to these manufactured images? People only post the highlights, though. I wonder what our kids will really remember. When I step back and think about it, really all I want is for my kids to remember Christmas as a happy celebration of Jesus’ birth.✝️ It really is that simple, right? We don’t need to make it more complicated than that! Someday our kids are going to be missing us like I miss my mom and Mamaw, and I want them to remember how we tried. We were never perfect, but we tried. We were there to teach them about Jesus. Yes, that’s what I want them to remember most about me. That I taught them about Jesus. No amount of money, gifts, forced smiles, fancy outfits, or Hollywood decorations could make Christmas any more picture perfect. We are loved just as we are. So true! I need to let go of all the other expectations of what Christmas should look like and focus on enjoying this time to celebrate Jesus’ birth. If things go “wrong,” is that really so wrong? What’s the worst that could happen if it is not all just so? In the end, God’s plan will prevail. It may not be like we plan in our mind, but it could be even better! 7 Ways to Get to Christmas Without a Total Meltdown by Carey Nieuwhof from theparentcue.org. In this list of 7, #1 is to Create Realistic Expectations and #3 is to Expect the Unexpected. Unmet Longings, Hope and Christmastime by Kelly Minter. “You can be following the commands of Jesus this Christmas season and seeking Him the best way you know how, and still there can be aches and gaps and even silence. You’re in good company with these two [Elizabeth and Zechariah]”. by Lisa Appelo from imom.com. Great, simple ideas from planning a movie night to writing a letter to Jesus. 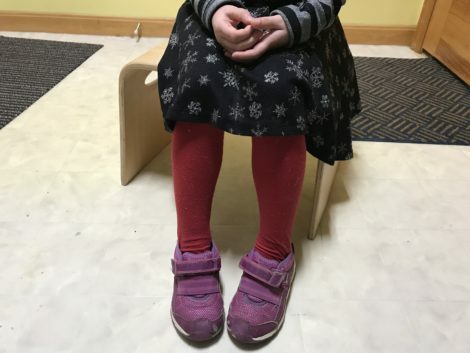 Take pictures of the would-be “blooper” moments, not just the “just right moments,” like the photo I took last Christmas Eve of my daughter’s pink sneakers and red tights! 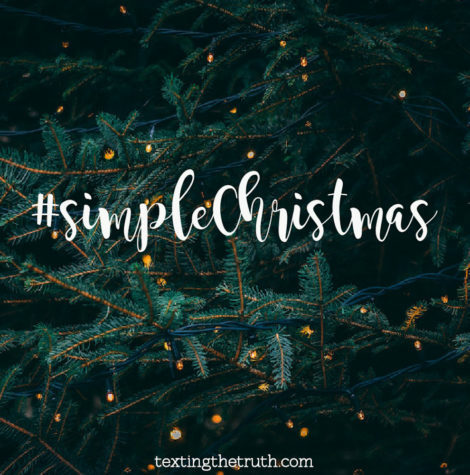 Post one of the verses we shared on your refrigerator or in your planner to remind you of your #simpleChristmas promise this season. You can make verse images on the free Bible app that could become your lock screen on your phone to remind you of the true reason for Christmas. Too Many Tamales or The Snowy Day are two holiday picture books that feature “accidents” that happen around Christmas and how kids learn to turn them into happy memories instead of melting down about them. They point back to letting go of unrealistic expectations. My eight-year-old son wants to talk about his favorite NFL football players and their stats all.day.long. Every day. The amount of sports trivia he can remember and recite is absolutely mind-boggling to me. Let’s be honest, I’ve never been interested in football or any other sport for that matter. I’m not athletic. I did not grow up in a sports-loving family. I don’t particularly want to spend all day, every day talking about which quarterback holds the record for most passing touchdowns or who is the best rookie wide receiver this season. However, I love my son. I want to connect with him. So, I’m working at learning football. My brain will probably never be able to store all the stats that his apparently can. But, I can now correctly identify the logo of each and every one of the 32 teams in the NFL. It doesn’t come naturally to me, but football trivia is a gateway to connecting with my son in this season of his life. Aside from being sports-obsessed, my eight-year-old also has a sense of humor that makes no sense to anyone else. (My teacher friend who works with students from K-8th grade assures me this is true of all 3rd graders. I hope she’s right!). He has an argumentative, know-it-all streak. When he starts back-talking, I almost wish for the days of toddler tantrums. Between my four children, I have had lots of experience with toddler tantrums (and still do – my youngest is 2 ½!😆). But, I don’t have a clue yet about how to respond to eight-year-old attitude. It would be easy for me to mourn how my oldest son has changed over the years. Can we rollback time to when he would fall asleep in my arms? When we bonded over books about construction vehicles? When we finger painted and played catch with a squishy ball in the basement? When he didn’t argue with every word out of my mouth? And, yet, I don’t want to go back in time. When my son asks me to play chess, it’s a real game. He wins just as often as I do. In my book, this is an upgrade from playing Candyland. Just last week, I had the privilege of talking with my son in a deep and meaningful way about friendship. How to respond when a friend lies and does something hurtful, how to confront, and how to forgive. I witnessed my son work things out with his friend and they have been riding bikes or playing basketball together in our driveway after school every day this week. My son now asks thoughtful questions about the Bible and about God. There are so many exciting opportunities to connect and to learn with him. So, I’m choosing to dance and celebrate who he is and how I can interact with him in this new phase of his development…even if it means learning much more about football than I ever wanted to know! In the same way, I can find myself mourning the challenges of the two-year-old developmental stage of my youngest son. I can find myself wishing for the day when I will no longer have to watch the clock and remind him to use the bathroom at regularly scheduled intervals. Wishing for him to outgrow his separation anxiety when I drop him off in the church nursery each week. Wishing for the stage when he can clearly communicate what he wants without melting into tears. But, I don’t want to wish for time to hurry with my youngest either. I want to savor and celebrate the moments that he crawls up into my lap for a story, the nights he wants me to rock him to sleep, and the last few remnants of baby talk he still uses. We aren’t having deep conversations about anything, but I can tell we are planting seeds. This week, he has been asking regularly, “God made me? God made you?” I’ve had the privilege of assuring him that yes, indeed, God made each and every one of us! Time brings change. 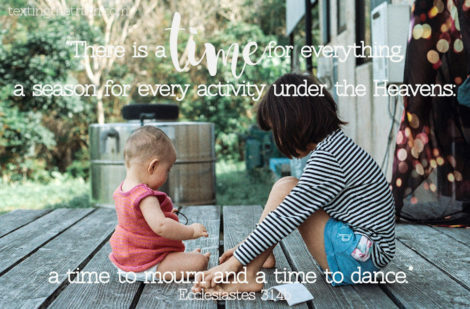 For us moms, this means our kids are constantly moving from one phase to another. Usually at a rate that is hard for me to keep up with. And while it is ok to acknowledge and mourn what is difficult at each stage (because there are always several difficult and frustrating parts to each stage! ), I also want to learn to dance and celebrate what is exciting about each stage. Because each new stage presents unique ways to connect with my kids and opportunities to point them to their Creator. “And Jesus grew in wisdom and stature, and in favor with God and man.” (Luke 2:52, NIV) As my kids grow through each developmental stage, my prayer is that they also grow in wisdom and in favor with God and man. Five Seeds of Faith to Plant in Your Child’s Heart from Jeannie Cunnion’s book Parenting the Whole-Hearted Child As my children grow older and pass through each developmental stage, I want to instill in them the value of each of the five seeds that Jeannie writes about (including: prayer, Bible reading, Scripture memory, community, and service). Check out these Developmental Milestones Charts, created by the CDC for children birth to five-years old or for children 6-8 years old. When I take the time to learn about the stage of development my children are going through, I can be better equipped to connect with them. Take some time praying individually for each of your children and the stage he/she is in. Ask God to show you how He is at work during this phase of his/her life. Ask Him for wisdom about how to connect with your children in this unique season. Love You Forever by Robert Munsch A classic children’s book and one that I often include in a shower gift for a new mom! It still makes me cry every time I read it. A beautiful description of the challenges and blessings of each stage we experience with our children.